In this episode of Workflow, Brian and Tom talk about their podcast creation process and meeting rhythms. 25:45 Tips for taking action! Tom: 00:00 This is Workflow episode five. 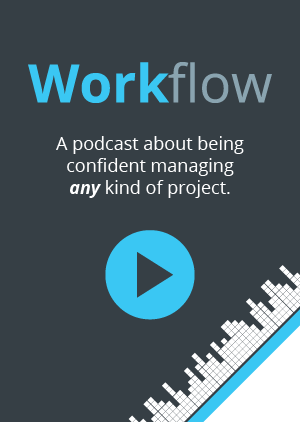 Tom: 00:14 Workflow is the podcast that helps teams to figure out the best way to work, collaborate and get stuff done, brought to you by Rindle. Tom: 00:29 Hey everyone. I’m Tom. Brian: 00:30 And I’m Brian. Tom: 00:31 And we’re the co-founders of Rindle and this is our podcast Workflow. Today. 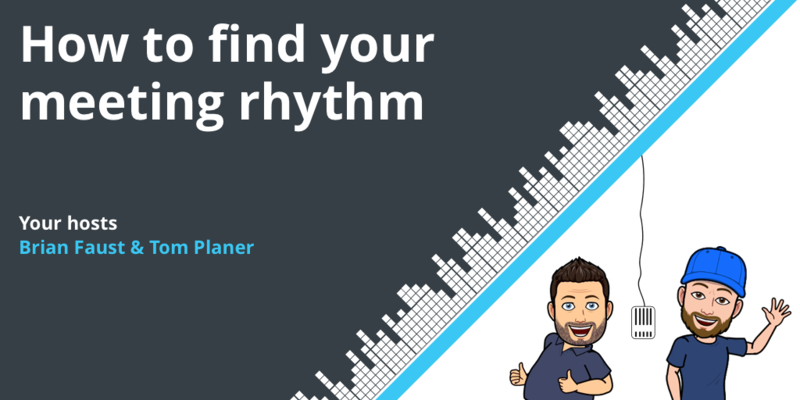 We’re talking about how to find your meeting rhythm. But before we get into that, let’s talk about what’s happening at Rindle. Brian: 00:43 Yeah. So the podcast is officially launched if you’re listening to this, in order when it’s released, we’re officially launched. So we’re excited. It’s episode five. Well, I don’t know, Tom, how are you feeling about that? Are you excited? Tom: 00:58 Yeah. Yeah. Real excited. We’ve been working on it for what, about a month now to get things in order. We wanted to have what, four episodes prior to launching it and yeah, it’s exciting to finally send it out to the world. Brian: 01:18 Send it out and get crickets. No, just kidding. Tom: 01:20 Yeah, yeah, pretty much. Brian: 01:22 Well, hopefully we have some listeners. That’ll be exciting. Um, yeah, so I thought maybe just touching on … The first time we’d done a podcast, you know, Rindle itself has not really sent any kind of podcasts and personally, you know, we’ve never done a podcast individually. Brian: 01:38 So you know, we had to figure that out. So I thought maybe like touching on the process that we’re going through right now might be interesting to some folks, especially if you’re doing one or potentially thinking about doing a podcast. Brian: 01:50 So, you know, just real quick to go through it. We basically decided to release one every week. So we have a set meeting now on Thursdays to record our podcast. So we’re pretty much stringent on meeting every Thursday and recording and that kind of kicks off the whole thing. So we actually use Zoom to record, that was recommended by a couple of people to me. So we already use Zoom for our meetings, so that was a pretty natural thing. We just record the meetings when we talk and then that gives you a video file and an audio file. Brian: 02:23 So we’re all set with just the audio version of the actual recording. Tom: 02:28 The actual recording it takes, what, about an hour to an hour and a half, probably get that down to about a solid hour every week, but we typically talk about what we’re recording prior to actually starting. So we’ll spend about 15 minutes talking about it just to make sure that we know what we’re talking about and then you go out and edit it. Brian: 02:50 Yeah. So I use GarageBand to edit, which I’ve used in the past. I actually did … I shouldn’t say I’ve never done a podcast, but I did one years ago on about dancing actually because I do west coast swing dancing. It was short lived. Only a few episodes, but I had and used GarageBand back then even so I’m pretty comfortable with it and I’ve done some video editing as well. So that was pretty natural, again, recommended by a bunch of folks to use it. Brian: 03:16 So pretty straightforward, easy to generally get the files in from Zoom into GarageBand and edit the file. Tom: 03:23 And then we send it off to rev.com. And what it’s a, I think it’s like a dollar a minute or something like that to have them transcribe it? Brian: 03:30 Yeah, a dollar per minute. And it’s a pretty amazing service. I mean, I had never used it before. Asia, who heads up our marketing, she recommended it to us. It’s really pretty amazing. The turnaround is amazing. And the quality’s really good so far. And it includes, you know, the speakers’ names, you can timestamp them. Really quick turnaround. Once I get done with editing the file and export out of GarageBand, I upload it to Rev, get that process within less than a day for sure. Sometimes within hours, I have a transcription in front of me. Tom: 04:05 Yeah. What? I think they say on their website, they guarantee a turnaround within 12 hours or something like that. Brian: 04:12 And if it’s over I think 30 minutes or so or something like that, you can check off to have an expedited delivery. Which I don’t know why anybody wouldn’t, I guess, unless it’s really not time sensitive. But that worked really well. So I usually, ours are usually over 30 minutes, so you know, again, within a few hours I usually have it in front of me. Brian: 04:32 Cool. From there, I create the artwork. So I use Sketch to do that and this is kind of a little bit of a funny story, but I originally created some emojis I guess if you will or an avatar for both of us. That didn’t go over so well. Tom: 04:51 You liked yours, but. Yeah. Brian: 04:53 I liked mine. It was okay. Tom: 04:54 I didn’t like mine. Brian: 04:55 It was okay. We didn’t want to use real pictures. We kind of want to have a little fun with it and use some avatars and things like that. So then Tom suggested using Bitmoji. Brian: 05:12 Nice. It’s on iOS and Android. Actually, I wasn’t sure I looked it up, it was, we’re both on iOS. But yeah, so we created those. Tom sent me his. And I was like, okay, it looks good. I’m going to create mine. And that’s what we ended up with. Tom: 05:26 Probably against their terms of service to do that, but that’s all right. Brian: 05:29 Yeah, it might be. Tom: 05:30 For this. But that’s okay. Brian: 05:32 No, that’s true. We’ll cross that path when we get to it. But what’s cool about it is you can have some different poses and different things so we could have some fun with it. But so we’re using that for our kind of artwork for per episode that we’re posting onto our blog and then we create a simple piece of artwork for the cover art of the actual podcast for iTunes. Stuff like that. Tom: 05:54 And then after that we post the recording to Simplecast and schedule it to go out. We found Simplecast. It seems to be fairly popular with just small, small podcasts. We might switch to something more robust in the future, but it seems pretty full featured. Relatively full featured. We’re trying to be about a week ahead on the podcast. Brian: 06:22 Yep. And then what’s cool about Simplecast, you can schedule it so you know, once you get it scheduled, it’s just going to go out when you wanted to go out and you’ve kind of set it and forget it. And then from there, once it’s set, then we just create a blog post on the same schedule. 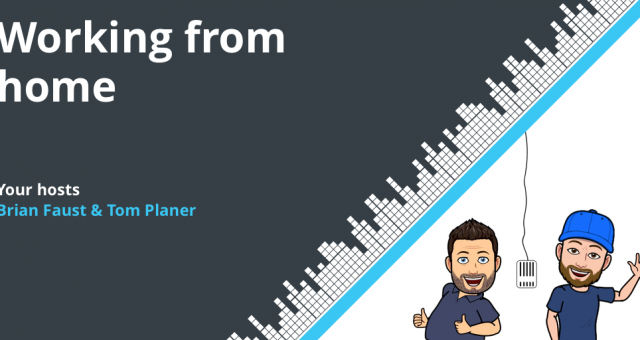 So we create a blog post for our blog with the episode, Simplecast as a player that we can embed right into WordPress and we schedule that for the same day and time to go out, and that’s it. I guess it sounds more complicated, but it’s fairly simple process, once we kind of worked out all the details. Brian: 06:53 I of course created a podcast board in Rindle, to kind of match this workflow so we have all kinds of ideas and topics in a backlog and then we move them over through this similar kind of process as we step these through so everybody knows where things are at. But yeah, so flowing really well so far. It’s early. I’m sure we’re going to tweak as we go and edit this process, but so far so good. Tom: 07:15 Yeah, it’s been fun actually. We’ve been talking about doing podcasts for a couple of years now, but never really felt confident enough to do it and I’m glad we finally got to it. Brian: 07:28 Cool. So let’s move into the main topic of the day. So I think this is pretty cool. We actually originally were going to talk about standup meetings, which we do every day. And then I remembered a talk that both Tom and I attended in Boston at SaaS Fest, and David Hauser of Grasshopper, but he was speaking there. Well, I guess before I continue Tom, what was your reaction to David’s? Tom: 07:58 David is a cool guy. He kinda goes against the grain, if you will, like he basically stood up there and said the exact opposite of what every other speaker at the talk said and basically said, forget what they’re talking about because the only thing that matters is what, MMR, and that’s about it, right? Brian: 08:28 Yeah, he was pretty direct, which I liked. I liked his approach for sure. He’s the kind of in your face, direct. Tells you how it is, which I definitely appreciate and I think his style also is very action-oriented. So the whole point of the talk was for you to take action out of it and you know, him to give you some advice and for you to be able to take action on that immediately, which I really like, because what’s the point, right? If we can’t take action and help our business, help our workflow, whatever we’re doing to kind of help things along and learn. So really liked that. Brian: 09:02 He’s like I said, I think he co-founded Grasshopper. He ended up bringing that to a $30 million ARR company. Ended up selling that. He started up a couple of other businesses, he’s been around the block so he’s got some experience to share. I thought it was good. Brian: 09:18 One of the things that he mentioned in there was meeting rhythm and something that he thought like, if you do anything, get on board with a meeting rhythm it, it makes a huge difference. And when I was thinking about standups and talking about standup meetings and things like that, this came to mind. I was like, you know, I remember this talk. I remember him talking about meeting rhythm and I thought it’d be cool to kind of talk about meeting rhythm in general because really standup meetings are part of that. So I thought it’d be a good chat for the podcast. Tom: 10:00 I … working hard. So, yeah. Brian: 10:04 Yeah, and it’s kind of little big against what you might hear out there because a lot of people are like, you know, “Don’t have meetings. Meetings are a waste of time, and it will make you unproductive,” and all of these things. I think in a lot of cases, that’s true. But I think the whole idea of creating a meeting rhythm is having a cadence and a sequence of meetings that make sense, and also their time box. Right? Tom: 10:52 Yeah. I think that’s spot on. Brian: 10:54 Cool, so before I get into kind of his recommended meeting rhythm, let’s just talk about what a meeting rhythm is. I kind of just touched on it but, you know, it’s basically regular scheduled meetings with a defined purpose. So, for example, a recurring daily meeting like a stand up, or a SCRUM meeting, or a weekly project status meeting you might have, or things like that. Not just one off meetings, these are things that where rhythm comes in is really meetings that happen on a predictable recurring basis. Brian: 11:24 So, he kind of went into his recommended meeting rhythm which was everybody in the company is part of a daily meeting, so that could be part of their department or whatever it might be, and everybody is also a part of one or more weekly meetings, and then the same for monthly meetings. So his, basically, ideal meeting rhythm was daily meetings, weekly and monthly. Tom: 11:45 And he went on to say that I think the goal is that … or, his goal even as the owner of the company was that he met with everyone in the company at least one time a month, correct? Brian: 11:57 [crosstalk 00:11:57] Yeah, and actually we enabled him as the founder to kind of be able to travel and be free, and wherever he might be, he can hop into meetings at any time during these sequences and rhythms that they have going, and get a pulse of what’s going on, so it didn’t … It was never a question of, “When are we going to meet? Is there a meeting this week?” They were just set on the calendar, no matter where he was, he could jump in and get a pulse of what’s going on and that made his life, especially as a senior leader, a lot easier. Tom: 12:27 Yeah, and I think that’s also just important for, I think, remote companies because you’re not actually in an office where you are just chatting with someone on a day to day basis. Yeah, we try to [inaudible 00:12:40] probably every hour during the work day, but it’s not like the same as being in an office somewhere. So, this really allows you to get a good pulse and feel a little more connected. Brian: 12:52 Yeah, so he also mentioned this kind of concept comes from, at least for him, it came from Scaling Up, and that’s a book by Verne Harnish. He highly recommended his book in his talk, and I think this is one of many points that he made from this book. But we’ll link this up in the show notes, but I actually am reading this now, so I am reading the audio book, so I’m cheating a little bit. But it’s been on my list, and I tend to have a large list of books I want to read. So, I am actually reading this one now, so I’m excited to diver deeper into some of the intricacies. But that’s where this kind of concept came from. You can search for that on the Internet and find some other resource on that same thing. Tom: 13:35 Yeah, audio books are great, though. That’s the one thing I do miss about the long commute I had previously. I listened to a lot of audio books and a lot of podcasts when I was commuting a long way. Brian: 13:46 I did it for that … I listen to a lot of podcasts when I travel, but I did it for that exact reason, because I wanted to be able to listen to the book while I was driving. Tom: 13:53 It also just flies by, the book. It takes what, like eight hours, and you’re done with the book. It’s pretty awesome. Brian: 14:00 Yeah. Awesome, so I think for the context of this podcast we’re going to stick with David’s meeting rhythm, which is daily, weekly, monthly. Brian: 14:10 We’re just going to … Let’s go through each one and kind of talk about some details of what those meetings look like so everybody understands what each meeting type is. Brian: 14:50 Yes, some … just because the off time, actually, makes people show up on time as opposed to saying 11:00 or 10, or something like that. Tom: 14:59 Okay, that makes sense. Tom: 15:03 Yeah, but I think that that’s important to mention that. A key to keeping it short is definitely making sure that everyone gets there on time. Brian: 15:13 Another thing to consider, kind of when you’re doing these daily meetings, is the setting. So, traditionally, the word stand up even comes from like standing in the meeting. The reason why that is, is because standing is uncomfortable. So if the meeting’s short, and people are standing, they’ll want it to be short and stay short they can move on with their day. So if you can, if you’re all in the same office or in the same room, standing is a great option. It will keep everybody kind of focused and in that time cadence. We actually do them over video calls because we’re co-located and remote. Brian: 15:46 I guess some people could be standing, I’m not even sure. But, I think it doesn’t really matter how you’re meeting in the end. I think the important thing is to keep it to 15 minutes or less, and to keep it distraction-free. So, you don’t want to be in an environment where people are going to walk up to you and say, “Oh, I just need Brian for a second.” Or, “I just need to talk to Tom,” and there’re disruptions and distractions, because that’s how the meeting gets beyond 15 minutes, and then you start actually wasting time. So, it should be in a distraction-free environment, so you can focus. Tom: 16:14 Next, we can talk about the participants in the meeting. So, Verne Harnish says, “In general, the goal is to have more people and less meetings, not more meetings with less people.” The goal is to have no more than I’d say 10 to 20 people in large companies, and individual departments. And teams should be having their own daily meetings. I am going to say that I haven’t read the book, but I feel like that seems a little much. Like, that’s going to be hard to get into a 15 minute meeting. I think that you probably want to keep that number a little lower than that, like maybe no more than 10 total, but that’s just my opinion. Brian: 16:54 Yeah, well I think the idea, also, is that any … so, for larger companies, too, so obviously in smaller companies the teams are going to be naturally smaller. Brian: 17:02 But I think his point is, with that quote even, is just that, you know, instead of having two separate meetings across your team because you can’t fit it in 15 minutes. 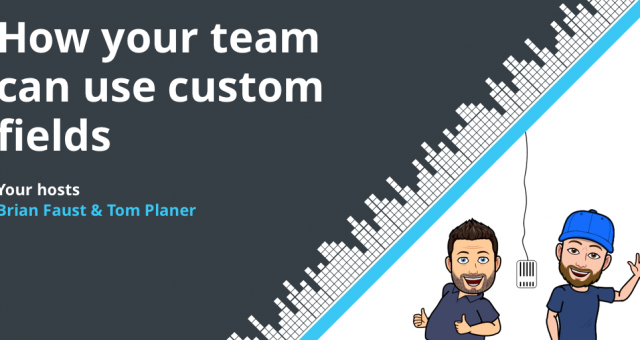 It’s actually going to cost you … You know, the point is to have more people in that meeting so the communication happens and everybody’s in the loop, and have one less meeting than you normally would as opposed to having two meetings to accommodate that. So yeah, I can see your point because I think when you get up to 20 people, obviously, that’s going to be tough to fit a status update, so that might be a little extreme. Brian: 17:32 But I think it’s something you just feel out. But I think the point is, too, that individual departments should be … You know, there shouldn’t be a multi-department type meeting, right? So individual departments should be running these individual stand ups as well so it can be short. It should be kept at the core people that need to be in it. Brian: 17:48 Yeah, and the other piece to have prepared is an agenda. So, for a short 15 minute meeting like this, you really want to focus on what did you do yesterday, for each person in the meeting, what are you doing today, and any issues or road blocks you’re having. So this way, it’s … Everybody’s kind of focused on the same thing and saying the same thing, and everybody knows what to expect and what to talk about as opposed to kind of beating around the bush and wasting time. This gives you a really good feeling, if you’re meeting every day, what happened yesterday between our last meeting, what are you doing today so everybody’s on the same page, and then any issues get dealt with right away. Tom: 18:23 Yeah, and we also really do make use of Rindle a lot here, just because we pull up a board and we look at it, and everyone sees, at least on the development side of things, we can see exactly what people worked on and what was moved over. Tom: 18:39 And then what they have on their plate today. Brian: 18:41 Yeah, and we actually used that blocked column in Rindle to track those issues and road blocks. So this way … Because sometimes you forget, right? You’re moving on, you’re doing lots of things throughout the day. It’s great to have an area to put those in, and on-the-calls will refer back to that and say, “Okay, let’s go make sure we have all the issues taken care of before we break and continue on working.” It’s really worked well. I think we’ve been a little more diligent with that in the last few weeks, so it’s had a positive effect on us, I think. Tom: 19:09 Yeah, I think it’s also a good thing that I’ve been trying to avoid deleting like a card before … I put it in blocked and purposely talked about it even if I know it’s something that isn’t going to be done, or doesn’t need to be done anymore, just so everyone on the teams knows rather than just delete it and [inaudible 00:19:29] don’t know what happens. Brian: 19:30 Yeah, and then you don’t have to have extra side conversations explaining why you did something, right? Everybody just knows, and then you can stop talking about it and move on. Tom: 19:37 Perfect. Yeah, we’re pretty bad at not having extra side conversations. Brian: 20:00 That actually and not kind of filling the day with meetings just to have meetings, but I ultimately think that’s a pretty bad excuse. Brian: 20:08 So I think we actually, our homework from this episode is actually probably to be more diligent with this and maybe try to get it to a 15 standup and then you know, leverage some other meetings throughout the week or something like that to, to if we need to have more in depth conversations. Tom: 20:24 Awesome. So moving on to the weekly meetings. So these are the meetings that you have obviously once a week and they can take an hour or an hour and a half and they typically are … you talk about a ongoing larger projects and more in depth like company parties and slash or just in general what’s happening with the company? Brian: 20:50 Yeah, I think these are the conversations like we were just explaining like, you know, even having our own stand-ups. These are the conversations that bleed into the standups, right? So it’s great to have like some weekly time set aside to talk about the bigger things. And we’re doing this now with even our marketing call. we’re calling it a marketing call, but in the end it’s a marketing update/product update for everybody. Brian: 21:14 What it’s good at doing is getting everybody on the same page as to all the marketing initiatives and projects that are going on, as well as the update on the product side and where we are with development releases and stuff like that. So, it was pretty interesting to think that we’re actually falling neatly into David’s suggested meeting rhythm. Naturally, we kind of started out with stand ups when we first started up Rindle, and now we’re graduating into weekly meetings which I think is pretty cool and helpful so far and then we’ll take it from there. Brian: 21:46 So yeah I think we’re enjoying those weekly meetings. If not, we should maybe be more diligent about … maybe split the time between marketing and product a little more, so everybody gets a fair shot at giving the updates. Tom: 21:59 Yeah, it is pretty interesting though. I feel like this entire process is pretty natural, like at a previous startup that I worked at, we were doing daily stand ups with the whole company when I first started there, and then we grew a little too large, so then shifted into just doing stand ups within the departments. And then we still kept a weekly like company wide meeting, that basically everyone spoke at. Everyone gave like a quick one minute update and then we talked about larger company parties, company goals, status updates on various things. Tom: 22:41 This whole thing does feel very natural and that’s why it does kind of make me wonder why more companies aren’t doing things like this. But you do hear very often that like, meetings are bad, right? I think that’s a cultural thing and I think that stems from these like, corporate companies that have meetings that really do waste time, right? And like way more people need to be in them then should and they don’t get anything accomplished. They’re just time wasters. Brian: 23:13 Yeah, I think if you really have a solid agenda and you’re not just talking like, I think the more corporate-style type meetings that you’re referring to, you know, or a lot of times, a lot of people talk about things, but really no action comes from it or no value really comes from it and I think that’s where the stigma comes from. Brian: 23:33 But if you have really solid agendas and especially if you’re using these for statuses on projects and individual statuses, it’s really useful for communication. It’s not just talking and being like, okay well we just did a lot of talking and really there’s no action and next week we’re gonna talk again. Right? And nobody’s really taking any action between, so I think if you follow those simple rules and keeping these time boxed. Don’t let them run over and having tight agendas, I think you’ll avoid that problem. Brian: 24:00 So the last one, our monthly meeting, so basically it’s similar to weekly meetings, but you know, we’re just meeting on a monthly timeframe. And these are really for, definitely more complex important issues. These meetings might require four to eight hours or more people being involved and really diving deep into specific company or department functions or specific challenges that you’re having and really go into those in detail. Brian: 24:26 We don’t do these yet formally at Rindle, but I think certainly you and Tom have informally just because sometimes we’ll have side conversations that span a couple of hours, for really complex topics. So I think as we grow, these will probably become more formal actually, where we might have these monthly meetings where we get the team around some overlying challenges or things we’re having company wide, where we sit down for a few hours together and figure out a solution or work towards a solution. And again, not bogging down the daily or the weekly meetings with these things. And really setting aside the time for these things. Tom: 25:07 You know, we do actually have a monthly meeting with our board that we do talk about stuff. It’s not a really long meeting, necessarily. We typically keep it to about an hour, but we do talk about the higher level overview of the company and the higher level goals. Brian: 25:25 Yeah, that’s true. So I lie. Tom: 25:28 Yeah. So we do actually do it. Brian: 25:32 Yeah. I think that as we grow too we’ll probably bring those team wide, you know, I do think for some of the kind of day to day challenges we’re having, not just higher level stuff, but yeah, that’s a good point. Yeah, definitely, always call me out when I’m lying. Tom: 25:45 Yep. I try to do that. Alright. So yeah, let’s hop into some tips for taking action. So obviously I think the first tip, since we’ve already mentioned it, is to maybe check out Scaling Up by Verne Harnish. We’ll put a link in the show notes for that. What, I guess, can you find that on Amazon or on your Kindle? Brian: 26:07 Yeah, we’ll link to the … Scaling Up actually has a website, so they have their different buying options, but I believe it is on Amazon as well. Brian: 26:15 Yeah. Another article that I stumbled upon doing some research is by David Cummings. He’s the co-founder of Pardot. Pardot was sold to Salesforce. So it was a pretty, pretty large company, but he wrote an article about the meeting rhythms that they had at Pardot. So, I think it’s a pretty good example of a larger company’s meeting rhythm. Brian: 26:37 It even extends into quarterly and yearly meetings, beyond what David had mentioned that we talked about today, sticking with daily, weekly, monthly. They extended out quite a bit. So interesting to look at if you’re a part of a bigger company or just want to kinda understand what that looks like. It’s a really good example. So we’ll link that up in the show notes. Tom: 26:55 Yeah. And I think, another tip is if you’re not currently doing any sort of meeting rhythms, like seriously considered doing the night at your company, if you, especially if you’re in a position to try to implement this, like try it out for months in and see what comes of it. Brian: 27:12 Yeah, I mean if you don’t know where to start, I mean if you’re not doing daily stand ups now start there, because that’s really the core of your communication. 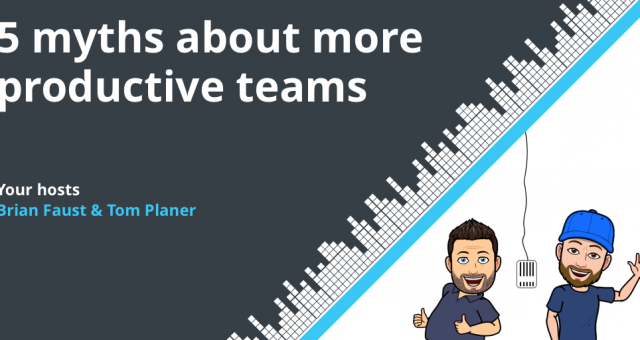 And it really does cut out a lot of the … I think the things we tend to rely on software for or expect software to do for us sometimes, but it brings everybody together to communicate and collaborate about what’s going on a daily basis. Tom: 27:33 It keeps everyone on the same page right? Throughout the entire company. Brian: 27:37 Without having to go through a bunch of data entry and typing and updating. It really just cuts out that and everybody can kind of focus on their work every day. They come together every day for that stand up, give their status, talk about issues and move on. And I think sometimes software gets in the middle of that and actually causes a lot more time and effort put into kind of matching something. Brian: 27:59 So if you’re not doing those, start there because I think it will change the way you work for sure. It’ll be healthy. Cool. So yeah, before we go, you know, as you know, we’re kind of launching this podcast fresh, so we love questions, topic ideas you might have. 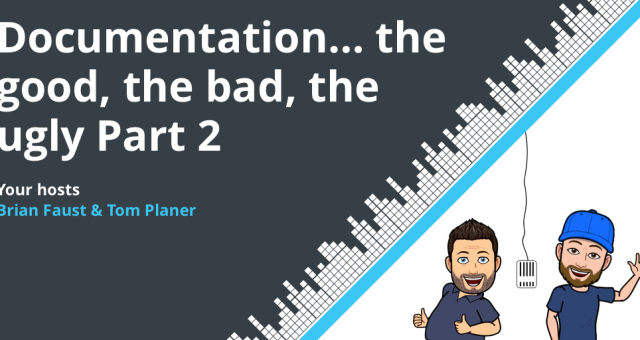 Even team scenarios that you’re experiencing now that you want us to talk about or tear down. Certainly reach out to us with those. Brian: 28:23 You can reach us on our voicemail number at 860-577-2293. You can email us as well at workflow@rindle.com, and you can also send us even mp3s through the email as well if that’s the way you want to communicate. That’s fine. Tom: 28:38 Yeah. And also leave us a review. Right? We love hearing feedback with everything. Like with our product, we absolutely love getting feedback from customers. Tom: 28:50 And same thing with this, like it really keeps us motivated to keep going, right? When we hear feedback. Positive or negative, it’s great. Tom: 28:59 Well, I think that about wraps us up for the day. If you have a question for us, you can call into our voicemail number at 860- 577-2293, or you could email it to us at workflow@rindle.com. Our theme music is an excerpt from Thunder Rock by MagikStudio, used under Creative Commons. Subscribe to us on iTunes by searching for Workflow and visit rindle.com/workflow-podcast for a full transcript of each episode. Thanks for listening, and we’ll see you next time.